Central Coast Opera is poised to deliver a stunning production of one of the worlds most loved and well-known opera’s, Puccini’s “La Bohème”. 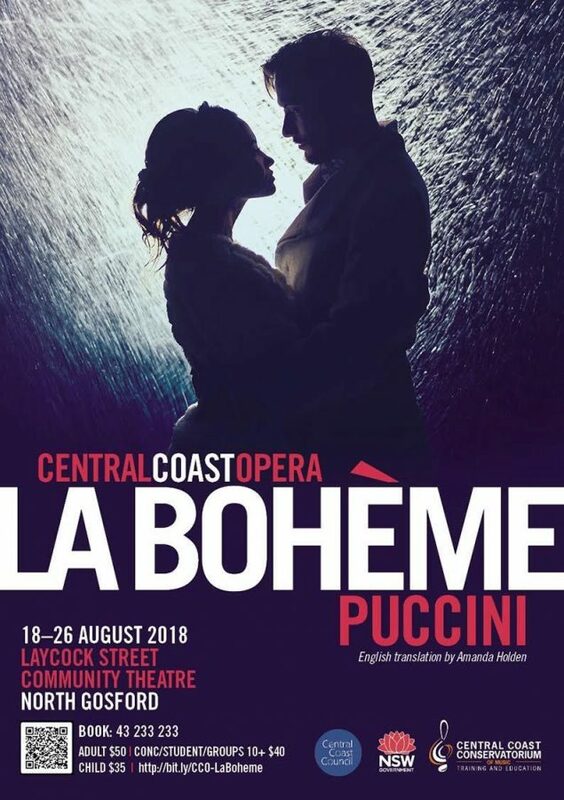 An affiliate of the Central Coast Conservatorium, Central Coast Opera’ s latest production, La Bohème, is set to continue the successful run of shows delivered by this ever-expanding opera company. Following on from last year’s sell-out production of Bizet’s Carmen (2017) and highly successful productions of The Magic Flute by Mozart (2016) and Menotti’s Help, Help The Globolinks! (2013), La Bohème is sure to leave the audience spellbound! The organisations provide a nurturing environment for aspiring operatic performers including cast members from the Central Coast of NSW, the Hunter Region, Sydney and beyond. The Central Coast Conservatorium of Music is delighted to bolster the learning of these artists through working with world-class vocal coaches, Christina Henson, Anne Haslem, Micheale Archer and vocal consultant Christine Douglas. Cast will also work with and learn from professional director Warwick Doddrell, and musical director Patrick Brennan. The highly regarded Central Coast Chamber Orchestra will accompany all performances. Composed by Giacomo Puccini, the opera La Bohème is the quintessential love story. La Bohème tells the story of a group of friends – a writer, a painter, a musician, a singer, a seamstress and a philosopher living a bohemian life in Paris. This is one of Puccini’s true masterpieces, featuring some of the most famous opera arias of all time. Be swept up in the mastery of lush duets, rowdy crowd scenes, and comical catfights taking place under the streetlights of Paris in 1945. Watch a tender love affair unfold under gently falling snow. Experience the delicious joy of love, and the passionate jealousy of besotted young lovers as our bohemians step up to face life’s challenges with courage and conviction. La Bohème reminds us through heartachingly beautiful songs that the riches worth having are within us, and no matter what the measure of our lives may be, wealth is about the magnitude of the human spirit and the depth of the human soul. Doddrell, has set this timeless love story in post war Paris in 1945. He delicately explores the concepts of love, in a world focused on commercialism, set to the backdrop of one of the world’s most romantic cities embarking on a journey of rediscovery. La Bohème, is an opera in four acts by Italian composer Giacomo Puccini (Italian libretto by Luigi Illica and Giuseppe Giacosa) that premiered at the Teatro Regio in Turin, Italy in 1896 and conducted by Arturo Toscanini. La Bohème has become part of the standard Italian opera repertory and is one of the most frequently performed operas in the world.